Mauviel is a French family business established in 1830 and located in Villedieu-les-Poêles, Normandy, France. Mauviel manufactures professional cookware for people who love to cook. 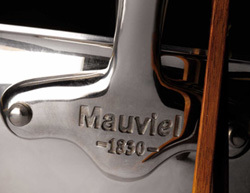 Their products are renowned in the professional world, with over a century of experience and a product of the utmost quality allows Mauviel to continue its strong manufacturing tradition. Mauviel offers an extensive assortment of cookware products for the home chef and professional chef. Mauviel cookware will bring pleasure and efficiency to any kitchen. For centuries the ultimate cookware has been copper, so it should not be surprising that today copper is still considered the category benchmark. Copper provides amazingly even heat distribution, thus preventing hot spots that cause foods to scorch and stick. It also responds to heat changes very rapidly, providing the cook with maximum control. Swissmar offers a variety of copper specialty items from Mauviel, France. The line includes egg -white bowls, Bain-Marie double boilers, preserving pans, flambe ladles, sugar sauce pans, crepe pans and much more. Attractive copper construction conducts heat efficiently. Specialty pan for pastry chefs to make upside-down-tarts, cakes, and pastries. Stainless Steel lined - use nylon or wood utensils only. Lifetime warranty.